Great quality & our family just loves this daybed. Only gave 4 stars because of the fabric....EVERYTHING clings to it...especially pet fur! Can't even wash it off. Since it's cream color a cover is a must have. 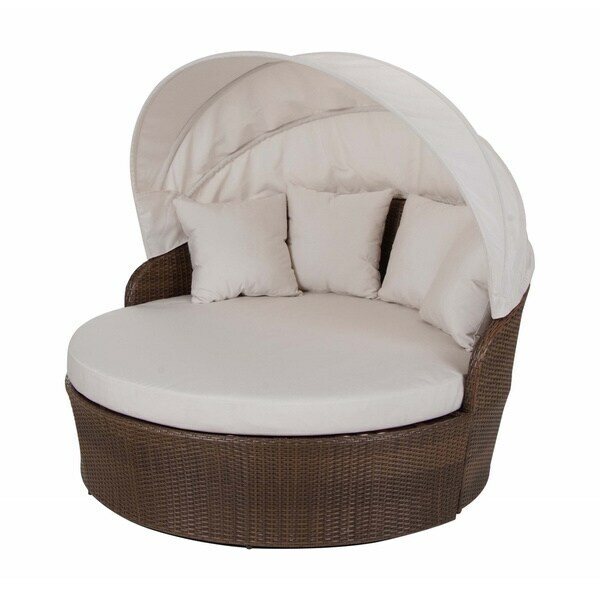 Take a nap in the great outdoors with this Panama Jack canopy daybed. A soft cushion supports your body in comfort for long chats, while the convenient canopy keeps off the glare during reading marathons. Use this daybed for lounging inside or out. The transitional design and neutral color scheme pair well with both contemporary and traditional decor on your patio or in your family room. Confidently place this durable daybed outside on your deck, and rely on the sturdy aluminum frame and weather-resistant synthetic wicker to withstand the elements. UV protection helps this daybed keep its color and strength after days of sun exposure. "Are theses cushions feather? or the pillows? I am allergic to feather that is why I am asking"
"what needs to be assembled?" Hello ChrissyP, this just requires that the canopy to be placed on, the bottom is pushed to the base and place the cushions on the bed. Please feel free to contact us again with any further questions. Thank you for shopping with us!